1. In pan, heat oil. Add roasted garlic, butter, tomatoes, and butter. Add in stock, next oregano, thyme, 2 tbsp. of the parsley, salt, and pepper, and reduce until slightly thickened. 2. Meanwhile, blanch all vegetables, each type individually, in simmering salted water, about 1 minute. Refresh in cold water, drain well, and set aside. 3. Turn off heat for sauce and stir in grated cheese. Add pasta into sauce. 4. 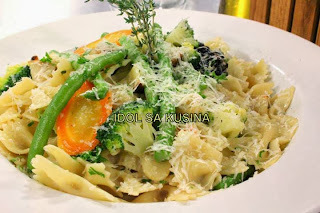 To plate, divide pasta and vegetables. Sprinkle each serving with parsley and serve.